1892 Envelope from Exeter to Launceston showing EXETER TRAINING COLLEGE Coat of Arms on the reverse. 1827 Entire from Sidmouth to Settle showing a very fine boxed MIS - SEN/TO/SHEFFIELD, YK 2672. 1854 Envelope from Penzance to Liskeard showing a FINE MISSENT TO/DEVONPORT IN YELLOW. 1828 Entire to St Columb showing on the reverse a very fine PLYMOUTH 'TOO LATE', DN 1132. 1845 Entire from Warrington to Dawlish with Manuscript '2' To Pay, cancelled by a Warrington '847' where the stamp would have been - Unusual. 1838 Entire from Teignmouth to Exeter showing a SUPERB three-line "Missent/to/London". 1859 1d Rose-Red, SG 40, tied to envelope from London to "Nr Exmouth" but "MISSENT to" TOPSHAM. 1804 Entire from Plymouth addressed to a Coffee House - IBBOTSON'S HOTEL, VERE STREET, LONDON, showing on the front a very fine Plymouth 218 mileage. 1790 Cover to AXMINSTER showing a fine DOVER/SHIP LRE, Robs S 3, redirected to London, and showing a two-line AXMIN/STER. 1857 Cover from Madeira to France via Plymouth showing a circular PLYMOUTH/date/PACKET LETTER in Blue, Robs P2. 1853 Envelope from Devon showing a 'SILVERTON' Undated Circle on the reverse and addressed to "GRAY'S INN COFFEE HOUSE", LONDON. 1848 1d Pink envelope to Ashburton showing a very fine DENBURY (under Newton Abbot) undated circle. 1844 1d Pink Stationery Envelope addressed to Bideford and cancelled by a SUPERB (Wessex-type) TORRINGTON circular datestamp - Scarce. 1843 1d Pink Stationery envelope addressed to London cancelled by a (Wessex-type) NEWTON ABBOT circular datestamp. 1813 Entire addressed to Exeter showing a very fine Type 1 'JERSEY.' SCROLL, MS 1/1, Jersey-Weymouth 3d and Inland UK rate 10d, SG JC 4. A fine print of Dartmouth Harbour by C Stanfield RA - 1793-1867. Very fine. 1881 Mourning envelope addressed to Hawkhurst, Kent, franked by a very fine 14 Dot 1d Pale Lilac, SG 171, and tied by a very fine Torquay '805" duplex. 1830 Entire from Devonport addressed to Chichester showing a superb CHICHESTER CIRCULAR DATESTAMP FOR "SE 28/1830", SX 319. SCARCE. 1879 8d ORANGE, SG 156, TIED TO ENVELOPE ADDRESSED TO PERTH, WESTERN AUSTRALIA "VIA BRINDISI" BY A VERY FINE DAWLISH 239 DUPLEX. Contents included. 1839 Entire from Devonport via Bristol to Glasgow showing a fine BRISTOL ADDITIONAL "½" in black and a very fine "V crown R" of GLASGOW, INSPECTOR'S MARK, changing rate from "1s 3½d" to "2s 6½d". 1811 Entire FROM ALICANTE to London showing an oval-framed 'SHIP - LETTER/crown/oPLYMOUTHo', Robs S 5. 1836 Cover from India to London "Pr Robarts" showing a VERY FINE BOXED INDIA LETTER/BRIXHAM, Robs IN 1, IN RED - Very Scarce in Red. 1844 1d Pink envelope addressed to Malvern showing a SUPERB MORETON HAMPSTEAD/PENNY POST, DN 910. 1837 Cover to Exeter showing on the reverse a very fine straight line "TOO LATE AT" followed by a HONITON circular datestamp, DN 766. Scarce. 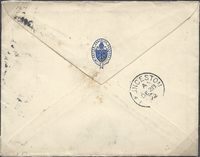 1849 Prepaid envelope to Ashburton showing a SUPERB CHAGFORD/PENNY POST, DN 163. 1880 6d Grey, SG 147, Plate 17, C-F, tied to envelope from Sidmouth to the Transvaal "via Plymouth pr Trojan Nov 19 1880" - Scarce Plate 17. 1815 Entire from Cadiz to London showing a SUPERB Step-framed PLYM.DOCK/SHIP LETTER in Red, Robs S3. 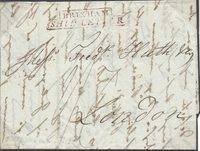 1845 Envelope to Woolwich showing a SUPERB TWO-LINE DEVONPORT/SHIP LETTER, Robs S7, charged 8d Ship Letter including Inland Postage. SUPERB - VERY SCARCE. 1895 Whitaker's Almanack Mulready Facsimile used from London to Plymouth. 1836 Entire from Calcutta to Madeira "Per Catherine" showing a very fine DARTMOUTH/INDIA LETTER, Robs IN.2, in Red. Superb. 1847 1d Red-Brown, SG 8, lettered M-J. A very fine four-margin example tied to local Bideford Entire by a SUPERB BIDEFORD CIRCULAR DATE STAMP. SUPERB! 1840 Entire from Liverpool to Dawlish showing a superb double oval "MISSENT/TO/BIRMINGHAM" in red, BM170. Superb. 1867 Mourning envelope from Edinburgh to Seaton, Devon, showing on the reverse a fine 'MID.RY./NIGHT in six-pointed star. VERY SCARCE, W212. 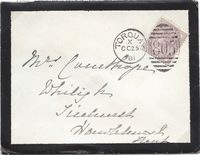 1850 Cover from Columbia to London "Per Choice" showing on the reverse a very fine SHIP-LETTER/PLYMOUTH IN BLUE, Robs S6. 1824 Cover from Valpariso to London showing a fine step-framed BRIXHAM/SHIP LETTER, Robs S4c, in MAGENTA. 1811 Cover from Coruna to London showing SHIP-LETTER/crown/PLYMOUTH, Robs S5. 1813 Cover from Barbados to London showing a very fine oval SHIP-LETTER/crown/o PLYMOUTH o, Robs S5.